After suddenly losing her daughter to a heart condition, Tina Eisenbeis has made it her mission to protect other children from the same fate. On Friday, she donated three more life-saving AEDs that will be available in case someone suffers a sudden cardiac arrest. "I'm just happy to be able to give you guys these and I hope that you won't have to use them one day. But, I know that I feel better that the kids will be safe," Eisenbeis said. Eisenbeis, head of the London Strong Foundation, chose DeCamp's Spotlight School of Dance in Burton, Roundhouse Stadium in Durand and Ms. Bridget's School of Dance in Fenton to honor her daughter London. The 10-year-old passed away in February from a heart condition no one knew she had. "You guys are London Strong now forever," Eisenbeis said. Ms. Bridget's School of Dance is grateful for the gift. 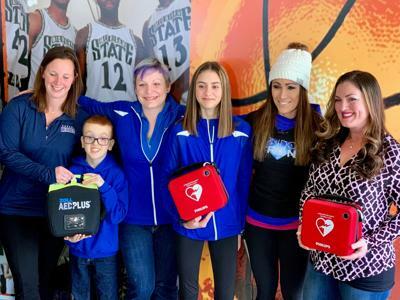 They applied for the AED not only because one of their 200 dancers has the same heart condition London had, but also because the life-saving tool was needed last winter when a dancer's dad had a deadly heart attack at the studio. "The roads were terrible," said Tracy Aaron, the studio's creative director. "We called and it took the first responders like 45 minutes to get to our place, just because of how terrible it was. And, I just can't help but think if we had a device like this earlier, you know, maybe he would still be with us." Carrie Shelly knows how critical an AED is to have everywhere. Her 10-year-old son Camden was diagnosed with a potentially deadly heart condition last year. Fortunately, doctors caught it in time. "I reached out to Tina after London's passing to tell her she wasn't alone," Shelly said. "To know that we can make a difference for other kids here on out, that's why we're here." She secured an AED for her son's middle school football field, where the principal said there are hundreds of students and their families on any given week. "The idea of having something there that could save lives is, you know, a relief in a sense that we know that we have something and we can do it," Durand Middle School Principal Paula Dobson said. The equipment is a providing a comfort London's mom said her daughter would be so thrilled she's providing. "She was all about helping everybody. That's all she wanted," Eisenbeis said through tears.